Council member Lawana Mayfield stops by a home going up across from the Bryant Park development. Beside it is a ranch-style home typical of the Camp Greene neighborhood. For this installment, we visit two neighborhoods in west Charlotte starting to see this transformation: Enderly Park and Camp Greene. New restaurants and businesses are moving into the long-time African American neighborhoods - and new people too, many of them white. With luxury homes and condos taking the place of brick ranches, some residents are forced to leave as rents rise. “You see the growth. You see the changes,” Council member Lawana Mayfield said, gazing west down Freedom Drive. To the east, you can see Charlotte’s skyline just two miles away. This is her district and she owns a home nearby. How do you create that balance? "This is the beginning,” she said, looking at an empty twelve-acre lot next to a Compare Foods in Enderly Park. Soon, it’ll be a four-story apartment building, which is nothing new for Charlotte. But at the Mezzanine at Freedom, rents will be based on income. The lowest earners can get a one-bedroom apartment for $350. Those will stand side-by-side with market rate units – a three-bedroom going for $1,500. 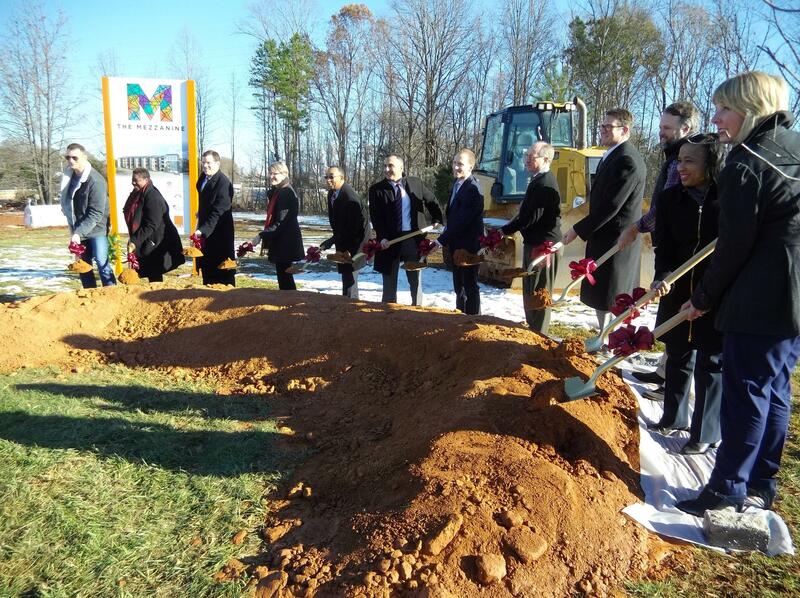 A dozen people held shovels ready to break the ceremonial ground. They represented two companies that donated the land, several other companies and a church that heavily financed the project. Also present were several people from the housing trust fund, the city and Housing and Urban Development. The Mezzanine at Freedom is hailed as both a miracle and the model for how to build affordable housing in Charlotte. A couple long-time residents watched the proceedings, including Cora Robinson. “I would think it would fit in quite well,” she said. Robinson has owned a home here for almost 40 years. Recently, she got an offer to sell for $138,000. ‘But that’s not enough, not for me,” Robinson said. She said she likes to see property values go up, but knows it has a downside. She snagged Mayfield to ask her about another recent project. "When did they do that to Columbus Circle?" "Oh, that started in 2017," replied Mayfield. They were talking about Bryant Park – a couple hundred attached homes and townhomes that ultimately took the place of Westwood apartments after another project stalled. A few days later, Mayfield takes this reporter on a tour through Bryant Park. It’s between Freedom Drive, Morehead Street and Berryhill, in an area now part of the Camp Greene neighborhood. Sale prices for townhomes there start in the low $300,000 range – very different from what it used to be. Townhomes at Bryant Park start in the low $300,000s. The development stands where Westwood apartments once was. Transforming neighborhoods is Mayfield’s area of expertise. Besides living in one, she’s also the head of the city council’s housing and neighborhood development committee. “If you go back and do your history, Berryhill had a lot of drug activity and prostitution many years ago. A lot of that was cleaned up,” Mayfield said. “But if you look at what is Bryant Park, the new homes facing directly the older, if you look on your right, you'll see a lot of the older homes are now...three-story homes going right next to garden ranch style [homes]." Bryant Park feels like its own neighborhood. There’s not much connection to the neighborhood around it. “That goes back to the language that we should and could look at putting in place regarding a development and how that development complements the current community as opposed to building a community within a community,” Mayfield said. Westwood apartments was sold several years ago before the recession. The change that worries Mayfield now is this. "We’re getting ready to go past five homes here, but look at the size of these homes." They're large houses, two stories, and about 3,000 square feet. "The homes that were here were all purchased, demolished and sold," said Mayfield. A plot of land in Camp Greene is prepared for construction. The homes beside it are new. 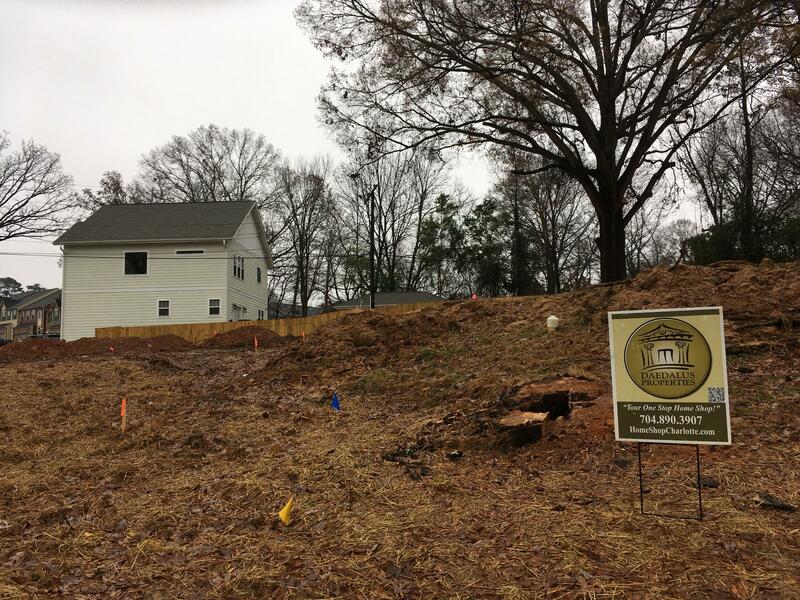 The sign in front of one lot reads "Respectfully old, tastefully new construction in historic Camp Greene.'" "Daedalus Properties is all over this community," Mayfield said. People are knocking on doors, offering money to buy homes in the neighborhoods. Some landlords are selling, giving renters a few weeks to vacate their homes, or raising rents. Mayfield worries that long-term, as more affluent families move in, there will be few African Americans left. "I want people to, if you made an investment, for you to see a return on your investment, but to the detriment of what? To the detriment of bleaching or displacing an entire neighborhood?" One of the ways to stabilize a neighborhood, she says, is through a targeted rehab program, aiming to bring homes up to code and make them more livable. As part of a pilot program, about 70 homes in Camp Greene and Lincoln Heights were rehabbed using $2.5 million. A plan is in place to expand the program to two more neighborhoods using federal funds. The catch? Homeowners must stay for several years or sell to someone deemed low-income. The program includes landlords as well, although they have longer deed restrictions and cannot boost rent during that time. The new homes have been going up at a fast clip in 2018 says Mayfield. She guesses about 20 families in Camp Greene have been displaced so far. "The question is going to be, by 2020, what has happened? What have we been able to save?" Mayfield asks. "All that to say: Yes, Mezzanine at Freedom is needed. Yes, we need a lot more." Figuring out how to striking a balance, Mayfield says, is critical. In other words, creating communities that are inclusive, and not displacing, that blend and do not divide.